Forty tons of meat and blubber erupt out of the calm waters along Lynn Canal. The entire body of an adult humpback whale emerges from the sea, twists around its core and falls back into the ocean. 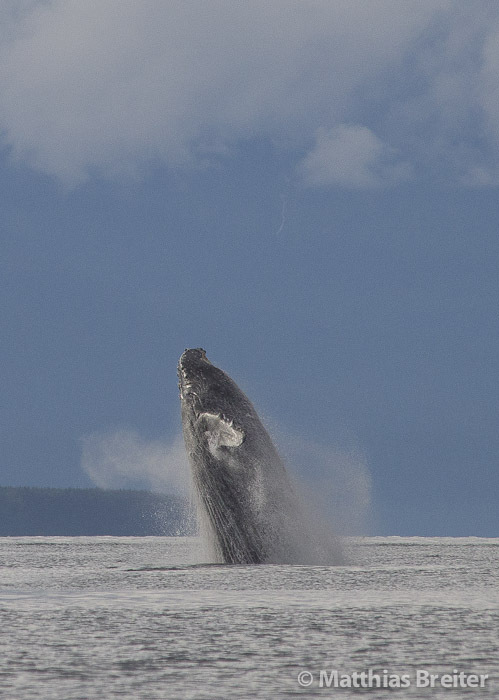 Icy Strait and Lynn Canal are known for their high concentrations of humpback whales during the summer months. Why the animals breach is the source of much speculation. Some feel that it may help the animal to dislodge barnacles from their skin. It also could be dominance behavior, or it may simply be an expression of joy. Point Adolphus along Ice Strait, opposite the entrance to Glacier Bay, is possibly the single best known place to observe humpback whales. The strong current swirling around the promontory concentrates small feed fish, and whales hang around this stretch of water all summer long, never moving far. At slack tide, when the current is at its weakest, the animals seem to indulge themselves with play such as tail-slapping and lob-tailing. The animals are known to repeat this performance over and over. At times the same behavior is used to warn other whales, as when the fluke hits the water, the loud resonant sound can be heard for miles. As whale populations grow, the number of whale carcasses that are discovered along the beaches is increasing too. Some animals die in collisions with ships. There are cases when whales get entangled in nets. Most fatalities, however, are likely due to natural causes. For scavenging birds and land-dwelling carnivores, a beached whale is a food bonanza that can last for several months, as long as the tide doesn’t take back its gift. The rich resource will attract grizzlies from far away. Mostly, it is the large boars that feed on the carcass. Sows with cubs stay their distance for sake of safety, and only come in when the males have had their fill and retreated for a siesta. This is an excerpt from Matthias Breiter’s award-winning book, Inside Passage.